Question: The reincarnation theory claims that we get our characteristics from our own past-lives karma, whereas genetics asserts that we inherit our characteristics from our parents, which is what we actually observe in the many physical resemblances among parents and offspring. Don’t these observations disprove the reincarnation theory? Answer: No, they don’t. The reincarnation theory doesn’t claim to contradict or substitute genetics; it supplements genetics and explains many observations that genetics leaves unanswered. Why do children born in the same family have moral and mental characteristics that differ from each other and also from their parents and even grandparents? For example, why does a child turn out to be an introvert although all other family members are extroverts? Why do twins who are born and bred in similar conditions often have significantly dissimilar behavioural and personality traits? Their genetic inheritance is near-identical, yet their natures are sometimes widely different. For example, one twin becomes a starry-eyed artist who doesn’t care much for money, whereas the other twin becomes a shrewd businessperson who doesn’t care much for art. Why the difference? Why don’t the children of geniuses become geniuses themselves? Often musical maestros can’t make their children into outstanding musicians just by begetting them or even by extensively training them. Why? How do children of mediocre parents become geniuses? Many genius artists were born in families that had no above-average artistic talent for several preceding generations, yet they had an inborn talent. Where did their talent come from? What explanation can genetics provide for the above observations – except for pushing them under the carpet by calling them “anomalies”? But the genetic carpet has too many concealed lumps to be overlooked; these observations demand an additional explanation. That additional explanation is provided by reincarnation. The Bhagavad-gita (15.8) explains that the souls who transmigrate from one body to the next carry with them their conceptions of life, which can be correlated with the mental and moral characteristics. When children are born from parents, their physical bodies come from their parents and so they resemble their parents’ physically, whereas their mental and moral characteristics come from their own past lives and so these characteristics differ from their parents’. Applying the Gita understanding to geniuses, those souls who have in earlier lives cultivated the self-conceptions of being artists carry to their next bodies that conception along with its associated talents – and so appear precociously talented. Thus, the reincarnation theory doesn’t contradict genetics, but supplements it by explaining much that genetics can’t explain. I totally agree. highly convincing article. Genetics explain how a particular body with its particular traits comes into existence, and there must be other variables, too – environment, association, etc. or even astrological differences. Bottom line is that a body is a product of the material nature with its laws of cause and effect. Reincarnation has absolutely nothing to do with this process, it explains why a particular soul gets to identify itself with a particular body. It’s like buying an apartment in a condominium that hasn’t been built yet – the building process and the result have nothing to do with buyers choice of the developer. The ability to buy a unit is reincarnation, the construction process is genetics. I agree with your point on cause and effect relation. It appears to me that the genes are gross manifestations of the subtilities from previous lives (including the environment/association in those lives) and in this life, the impressions from the environment are recorded in the subtle body and are grossly transmitted via the genes in the next life (with the subtle body always being present till liberation). I am unable to agree that there is ZERO-correlation between genetics and reincarnation and I strongly feel that reincarnation provides explains the ‘CAUSE’ and the ‘EFFECT’ is observed through genes. 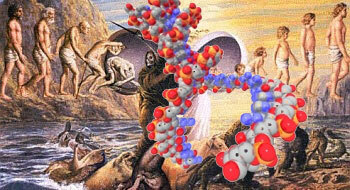 In other words, reincarnation supplements the observed facts (in the form of genes). One argument is about the question of why a certain allele dominates over another and the dominant-trait is explicit in the species. This could be best attributed to reincarnation at the fundamental level rather than by superficial explanation (by chance…else, an anomaly etc.). In short, there is a deterministic mechanism at the fundamental level for every stochastic process which may not be quantifiable by scientific concepts at present. Moreover, if I have not misunderstood, the building analogy points out that Krishna (through material nature) is the developer/constructor and the soul is the buyer. In the present case, there is a strong correlation in terms of the developer wanting to fulfill the desire of the buyer (at the same time purify the consciousness/desire of the buyer to quit all such buildings voluntarily) and so he arranges for the building in that particular manner as per the buyer’s desire. I apologize for any offenses I committed while writing, though I did not intend to. Please kindly forgive me if I did so. VERY NICE ARTICLE EXPLAINING THE DIFFERENCE IN APPROACH OF GENETICS & REINCARNATION THEORIES. IN MY OPINION,THE PHYSICAL BODY MAY FOLLOW THE GENETIC TRAITS BUT THE MIND & INTELLECT ETC. ARE ALWAYS GIVEN BY THE PAST LIFE KARMAS! your article are very very nice. your explanation is so simple to understand for the layman like me. i have distributed many of your articles among our ROTARY members of ROTARY BANGALORE SOUTH. Hare Krishna Prabhuji…….! Wonderful explanation. I fully 100% agree with this clear and reasoned answer.